Commercial / Residential Acreage with Highway 61 Frontage For Sale in New London, Missouri. 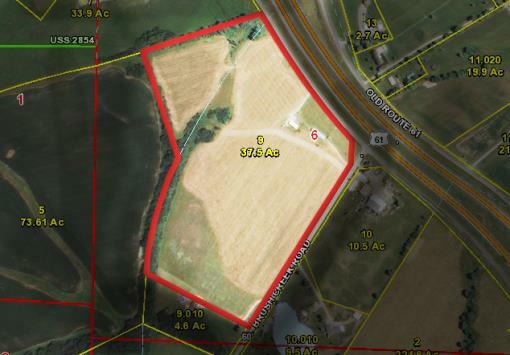 Tillable acreage & utilities located just outside of New, London, Missouri. Property includes 37.5 acres, and has water and electric on the property. Located at the Hwy 61 and Hwy 19 interchange. 2015 MODoT average daily traffic counts were at 11,516 for the interchange. The property has approximately 1,100 feet of highway 61 frontage and would be an excellent site for a commercial operation with great highway visibility! For more information and to schedule showings, contact broker Jose' Cruz at 314-803-1104. Jose’ Cruz was originally raised on a small farm in St. Charles County and later attended the University of Missouri, Columbia. As a 1989 graduate in Agricultural Mechanization, he returned to develop the first 100% biodiesel powered truck in the U. S. While working for the university he was hired away as a territory manager to represent Fabick Tractor’s agricultural division. In 2001 a unique opportunity offered itself as he was able to start a large farming operation near Jefferson City. He began to farm and took a management position at a construction company. In 2006 he became a sales associate for United Country Real Estate. His background provided the expertise to sell farms, recreational, and commercial properties. His success led him to receive the Pinnacle Silver award in both 2008 and 2010. Jose’ contributes his success to honesty, attention to detail, and listening to the needs and wants of his clients.